I have been tagged by Hi-D over at Bugs, Boys and Burritos. 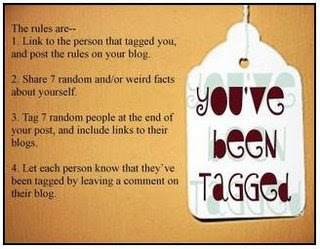 I've only been tagged on other time, I believe (Will I repeat myself? Probably). What's so great about being tagged this time is that Hi-D is from a blog that I stumbled on in my Blog Bumblings. Her blog is wonderful - I highly recommend you check it out. At 32 years of age, I am still afraid of the dark. I was held back a grade in early elementary because I couldn't read or write English. I had moved to Mexico with my family in kindergarten and became fluent in Spanish. When I came back to the States, I got it in my head that since I was in America, I needed to speak English (an adult told me, perhaps - or maybe I just wanted to fit in?). As a result, I cannot read or write Spanish fluently. Sometimes, it seeps in every now and then...but most of the time, Nada. (Ha! See? Nada means "nothing" in Spanish). I took two years of Spanish in high school to fulfill a foreign language requirement. I still cannot speak Spanish (see #3). I, too, have moved a lot in my life; so much in fact, I was convinced that my step-dad was involved in something where he had to hide. I have lived in CA (where I was born), AZ, IN, NC, VA, FL and finally, GA. I've not only moved state-wide, but city-wide, as well. In fact, in the first 7 years of my marriage, I had moved ten times. And no, The Man Beast is not in the military (neither am I, for that matter). When I first got married, Man Beast did all the cooking because I could not cook. He remarked the other day, "Haven't you noticed that I haven't been cooking as much?" As a matter of fact, I had. I just figured it was because he did that little thing called provide for his family by working 12 hours a day. Who knew that it was because of my improvement in cooking that he wasn't cooking as much? The term, Man Beast, is not my own. I owe it all to my dear friend, Taxi, who coined the phrase after she met my husband. It is to her that I give all props, high fives, back pats and belly rubs. Thank you, dear friend, for coining such a bodacious phrase. That's really sad that you lost all your Spanish. Adults really need to encourage children fortunate enough to grow up in another culture to keep what they know! Just think of how popular you are, sweetie! Thanks anyway...and again, I'm sorry for the multi-tag. Iva, thanks for the promo to my blog! You are sweet! You moved a lot too! Wow...and we both ended up in GA! !